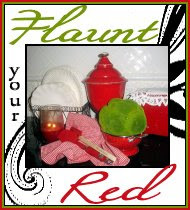 "Flaunt Your Red" a day late! 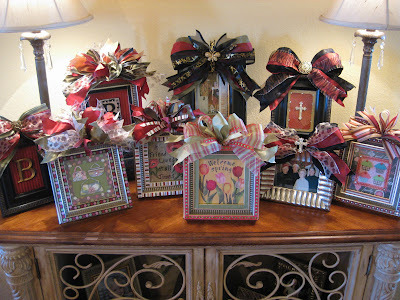 by nancy at http://southernlady-nancy.blogspot.com/ . What a great event! 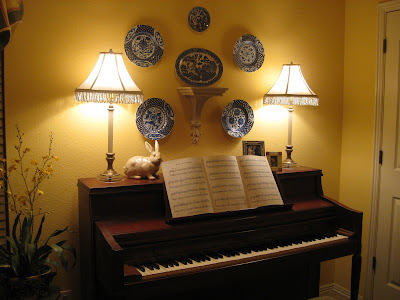 Today I wanted to show you a few pics of the "MAN'S" Room.....well, he shares it with me, lol! This is where I do my blogging. Here is our new sofa we ordered from Ashley Furniture a few months ago. We had our old sofa for more than 10 yrs. and it was looking and smelling a little bad! So, with some of my christmas decorating money we decided it was time to get a new one. I didn't like the pillows that it came with and had these on my old sofa. They add alot of color when they're not thrown on the floor. 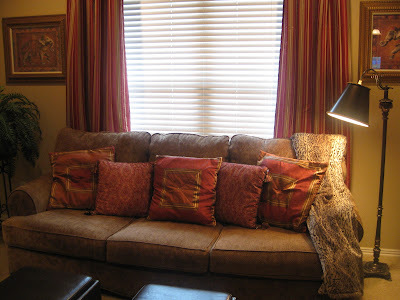 I had the curtains already and knew they would look fine with the new sofa. The red in here is more of a cinnamon color. 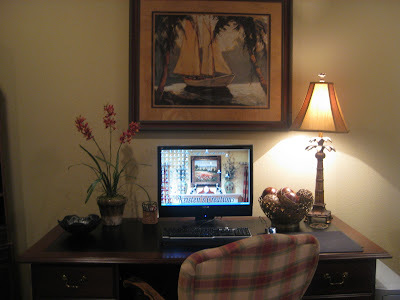 Here is where I do my blogging. 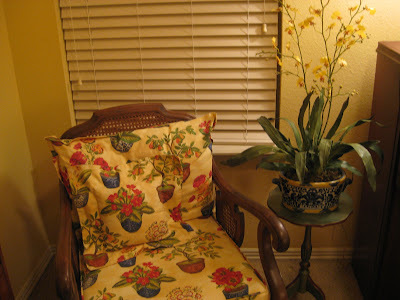 The chair, orchids, and decorative balls all have the cinamon color in them. The bowl to the left was handmade in Hawaii to resemble a volcano, it looks a little like an ashtray. And my favorite drink! 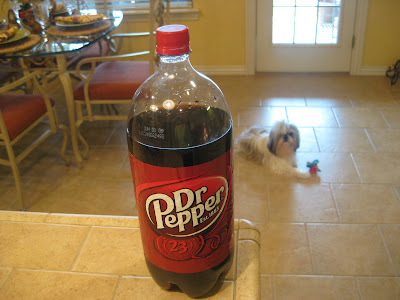 I got to have my DP! Oh, and the chairs have new red fabric on them too. I'll show you a better picture later. Thanks for your visit! Have a great weekend! 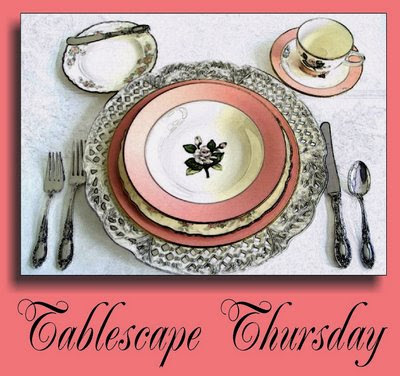 Welcome to Tablescape Thursday hosted by Susan at http://betweennapsontheporch.blogspot.com/ She is the tablescape queen! 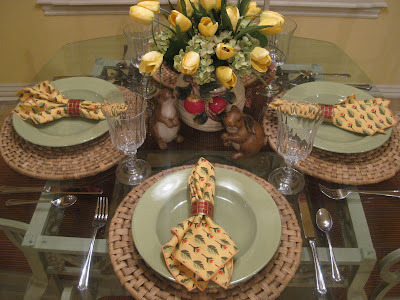 Her easter themed tablescape for this week is beautiful! Go visit her to check it out and for a list of all the participants. 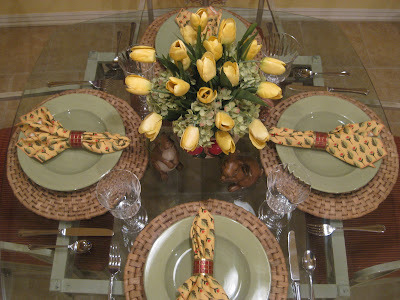 I assure you that you will get tons of ideas for your own tablescape! This is my spring inspired tablescape. 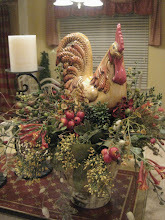 I found the tulip arrangement premade at Michaels, but took it apart and added the hydrangeas. I then put it all together in the ceramic apple pitcher. 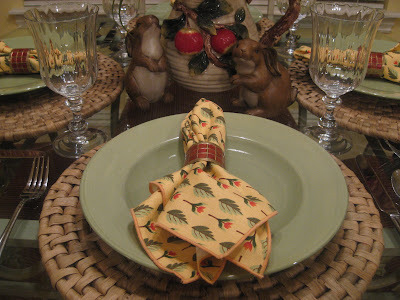 I bought the green plates at Pier 1, napkins at Dillard's last year, and the rabbits the other day half price at Hobby Lobby. As you can see this is a very small table and we eat here everyday. 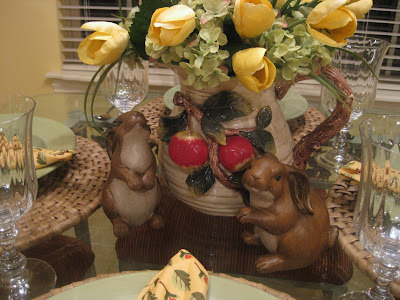 The rabbit on the left looks like he's trying to smell the tulips! Thank you for visiting me! Hope you enjoyed my little spring tablescape! Hey guys, we had a great time in Branson. Chase loved it! 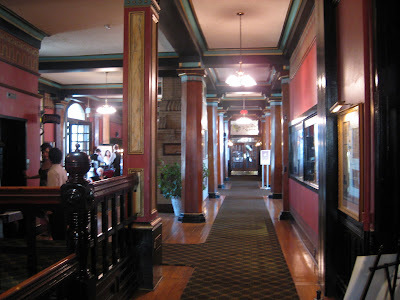 We stayed at the Grand Country Inn, it's a really neat place for kids. 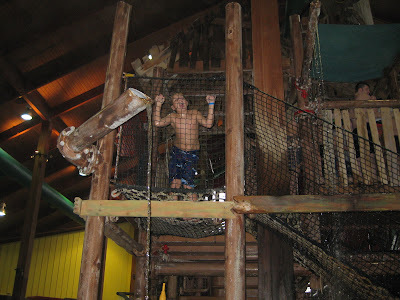 They have an indoor water park, putt putt, game room, and a wonderful buffet! 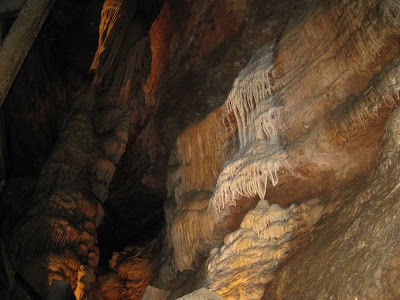 We also went in Talking Rock Caverns and there were NO bats! Thank goodness..... 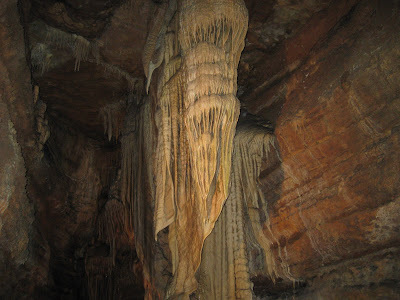 It is a really awesome cave that was discoverd over 100 years ago by some rabbit hunters. It's also a living cave so it's still growing. Chase and Kevin went to the Titanic museum after they dropped me off shopping. I've already seen it, but Chase really wanted to see it again. 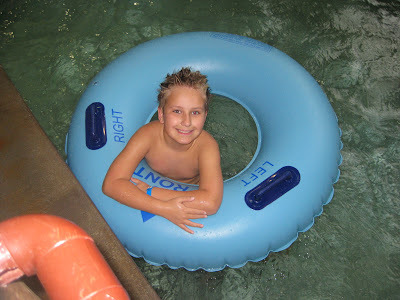 Here is Chase at the indoor waterpark. 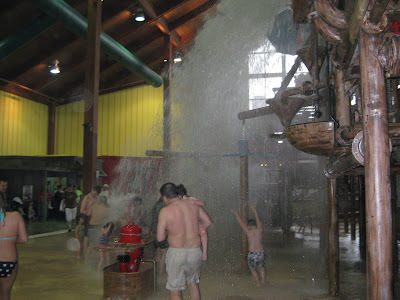 Every 10 minutes a huge bucket of water spills and all the kids go crazy when they hear the bell sound. Chase is under there somewhere! This is inside the cave. It was so neat but weird! The tour guide explained how the cave was developed, it was really facinating! I thought this looked like a giant jellyfish. 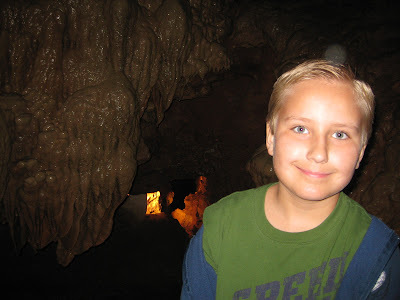 Chase loved the cave, he thought it was so cool! He learned all about how caves are made last year in school, so it was really interesting to him. 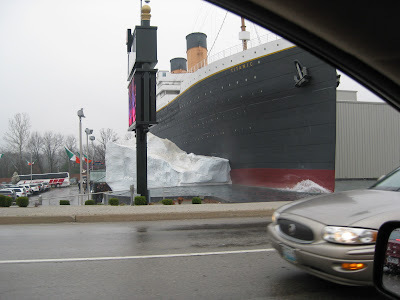 This is the Titanic museum if you ever get a chance to visit one you should, it's really a moving experience. I believe there are more exibits around the country. 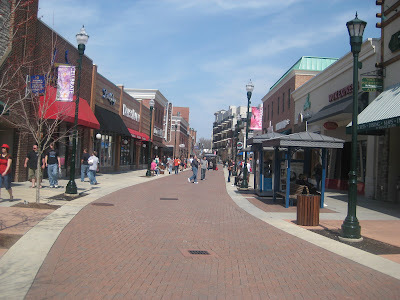 This is at the Branson Landing. There are tons of shops including a Bass Pro shop where we spent most of our time. It was a fun trip, especially for Chase. We live about 2 and a half hours from Branson, so it's not to far and you can have alot of fun on a little money. That's one reason we like it, lol! Have any of you ever been there? I would love to hear from you if you have. Have a great Spring Break! I'm so glad it's getting warm! Although, there is a chance of snow here on Sat., YUCK! Still time to register for the Frames!! Hey guys, just reminding you to get over to Fort Thompson and register for the Frames. The registration ends on Sunday at 12:00 noon CST. Check out the post below for more details. Good luck!!!!!!!!! 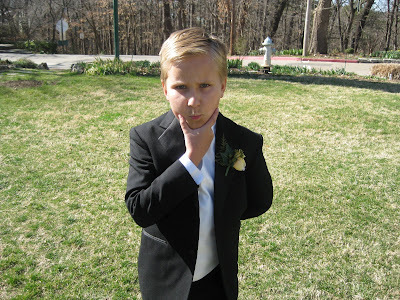 I will be in Branson for the weekend, Chase loves it there! He can't wait to go back to the Titanic museum, last time we were there for hours! 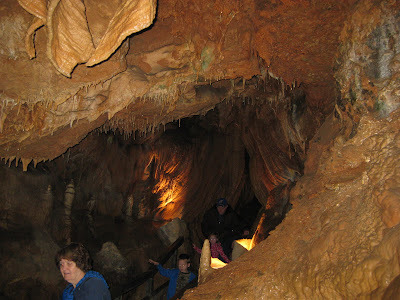 We are also planning to go in the Talking Rock Caverns. I hope there's no bats! lol...Talk to ya'll when I get back! Hey guys, thanks for all the input on the patio. I will be looking for more colorful pots, outside artwork, and colorful cushions. Well, I've looked all over town for cushions, pretty ones are hard to find! I will be working on the patio for the next several weeks and will post it when it's done. I am giving away 2 frames! 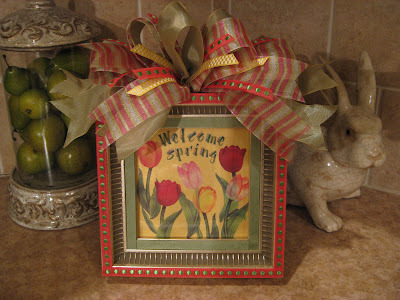 An initial of your choice and a "Welcome Spring" frame. Tim will have all the info. 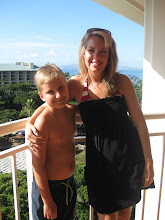 on his blog on how to register, so head on over there!! Just click on the Fort Thompson link. 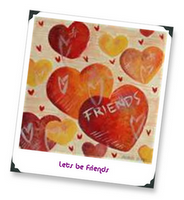 My Etsy Store is located under "My Links" on the left hand side under "My followers". 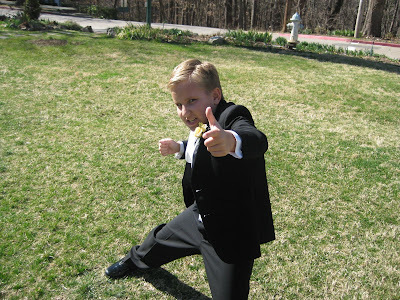 Oh my goodness, I just realized today is St. Patrick's Day and I sent Chase to school without a stitch of green! He's gonna get pinched all day, poor little guy! Time to refresh for spring! I know we are all ready for spring, Right?? It was 80 degrees here on Tues. and today it was around 40 degrees. Ugggg......I was enjoying my flipflops and capris! Today, back to the heavy clothes. Well, it won't be long before it stays warm, I hope. I wanted to show you guys what my patio looks like right now, not too pretty, huh? In fact, it's quite ugly. I wanted to tell you my plans and get your input. 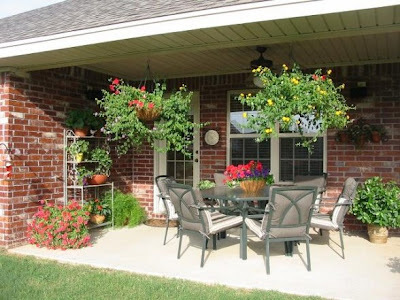 What about painting the furniture a bronzy color, getting new cushions(with some color) and staining the concrete?? 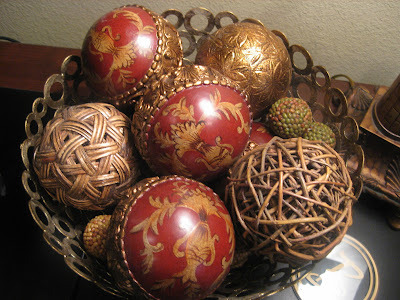 I was going to stain it this fall, but just didn't want to tackle it and still not to sure about it. Any other ideas? Of course when the weather stays nice I will plant lots of flowers. Tootsie has the most beautiful flowers, I wish I enjoyed planting as much as she does! I think a little cosmetic work will freshen the patio up, I've had the table and chairs forever, but don't want to spend the money for something new right now especially when it's still in good shape. Let me know your thoughts. Thanks!! Here it is last year, it looks much better with flowers and greenery. BIG difference!! Stay tuned for the giveaway, it's going to be on another blog. Details coming soon!! The Giveaway will start tomorrow March 17!!! 3 posts in one! 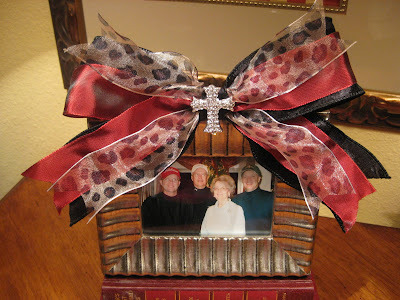 A sweet award, more frames and wedding pics! Hey Guys! I can't believe it's been a week since I've posted!! 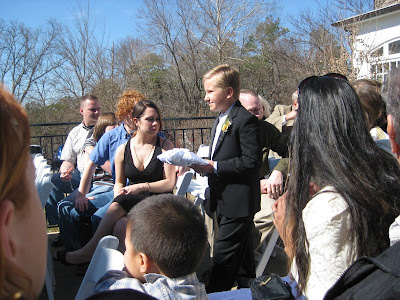 Last week just flew by, I think part of it was getting ready for my brother-in-law's wedding in Eureka Springs. 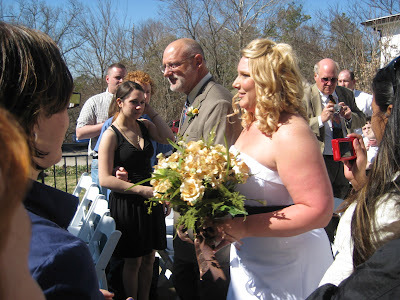 I did the flowers, everything turned out great and it was a beautiful day. I have pictures at the bottom of this post. 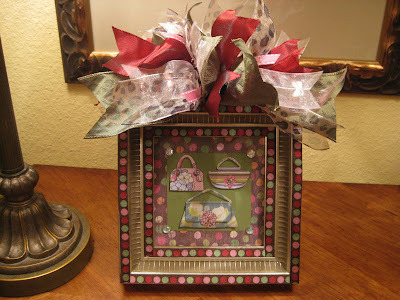 I also recieved a special award from Kim at http://kimsdomesticbliss.blogspot.com/ and Connie at http://mythoughtsandcreations.blogspot.com/ Thank you guys I really appreciate it! The description for this award is: “These blogs are exceedingly charming. These kind bloggers aim to find and be friends. They are not interested in self-aggrandizement. Our hope is that when the ribbons of these prizes are cut, even more friendships are propagated. Please give more attention to these writers. Deliver this award to eight bloggers who must choose eight more and include this cleverly-written text into the body of their award.” Also put a link to their blogs and then let them know they have been selected. I consider each one of you my friend and cannot think of anyone who has not already recieved this award, but if you haven't please take it!! I've been making more frames, come take a look. These will all be listed in my Etsy Store. 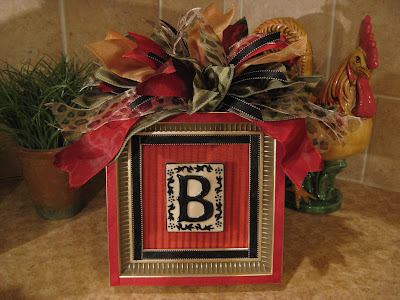 Remember the initial frames can be done in any letter. I would be happy to make a baby boy frame with the carriage too. 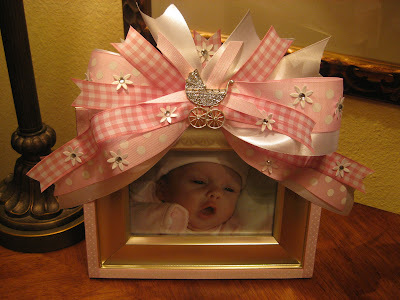 The picture in the frame is one of my friend's twins. I posted their room a while back before they were born. They are both beautiful! 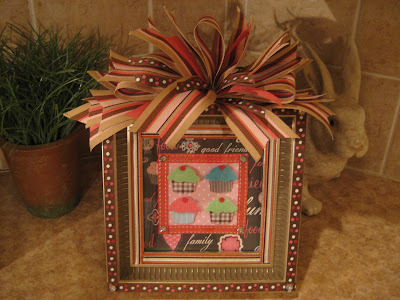 I can also do this frame in different ribbons. The cross is really sparkly! That's my grandma, dad and two uncles in the picture. 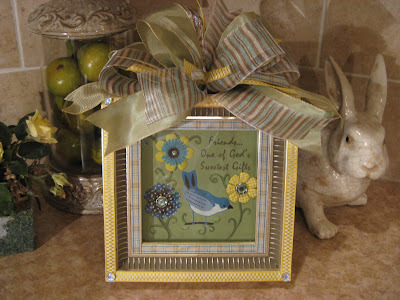 A great gift for a friend that decorates with the blues and yellows! This one is very detailed. 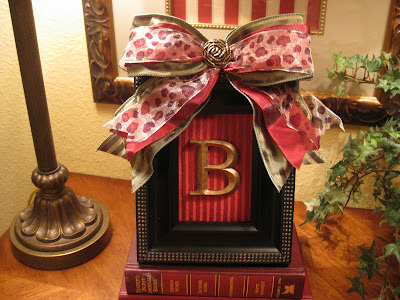 This one would be cute in a little girl's room or bathroom. I just fell in love with the little purses! Cupcakes for the kitchen! I posted this one a while back without the bow. The ribbon really adds to it! I'm still having so much fun with these! Remember, if it's possible, I can custom make one of your choice. I still have lots to make! I will be posting some spring ones in the next few days. 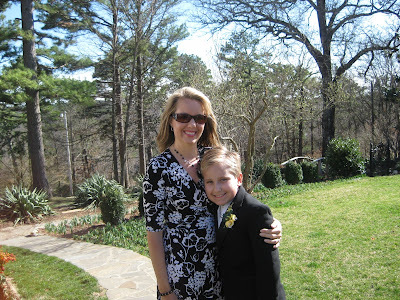 We went to my brother-in-law's wedding at the cresent hotel in Eureka Springs yesterday. 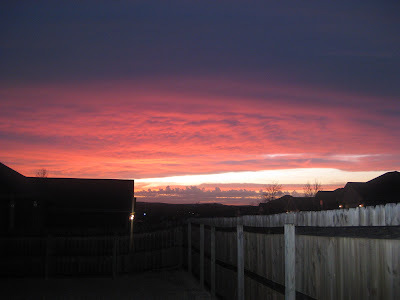 It turned out to be a beautiful day so I wanted to show you some pictures. 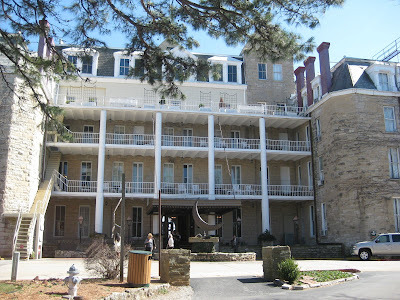 They say this hotel is haunted and has even been on Ghost Hunters. LOL! Does anyone see a ghost in here?? I sure don't! 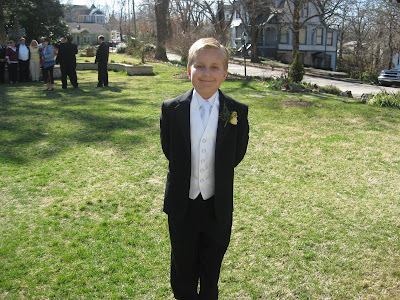 Chase was the ringbearer and could not wait to put on that tux! This is Melanie, my new sister-in-law. She's really sweet and looked so pretty! I did her flowers, her colors were yellow and brown. I used silk since the wedding was out of town but I tried to make them look as real as possible. Hope you enjoyed the pictures, I will have another post soon including some givaways!!!! More info. on that soon!! Hi Guys! 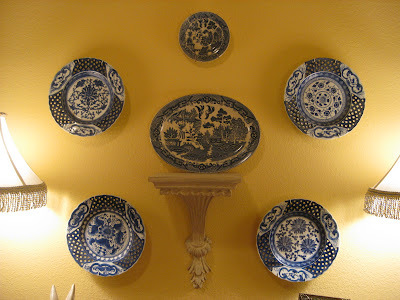 Welcome to my first "Blue Monday" hosted by Sally at http://smilingsally.blogspot.com/. 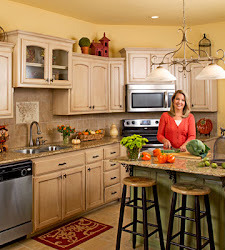 I have just recently discovered her blog and will be visiting her often! 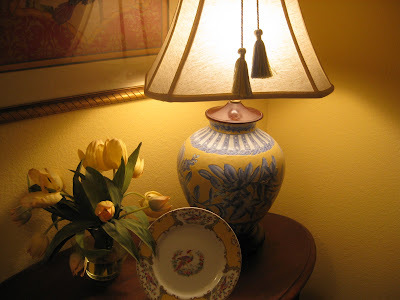 This room doesn't have alot of light, especially at night, but I tried to get a good shot of the lamp. My mom gave it to me when they moved. I fell in love with this fabric almost 10 yrs. ago (oh my gosh I didn't realize it's been that long!) Well, I still like it! I also have a little sofa that matches on the other wall. 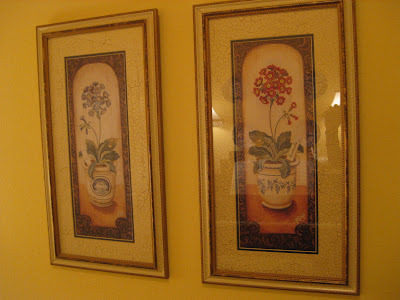 These pictures hang over the sofa, I would have taken a picture of it, but it needs a little super glue on the back. lol! 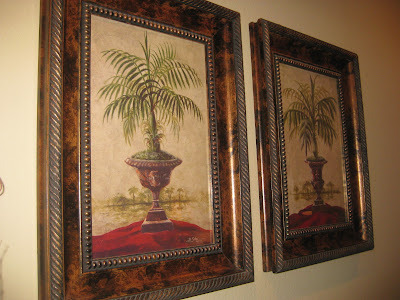 But look how the pictures match the fabric! I've had those a while too. That's most of my blue! I have a little more, but I'll save it for another post. Thanks for stopping by!! You can now comment if you don't have a blog. I would love to hear from you!